When AirPods were first released last December, one of the primary concerns voiced around the internet was that the earbuds would be too easy to lose. 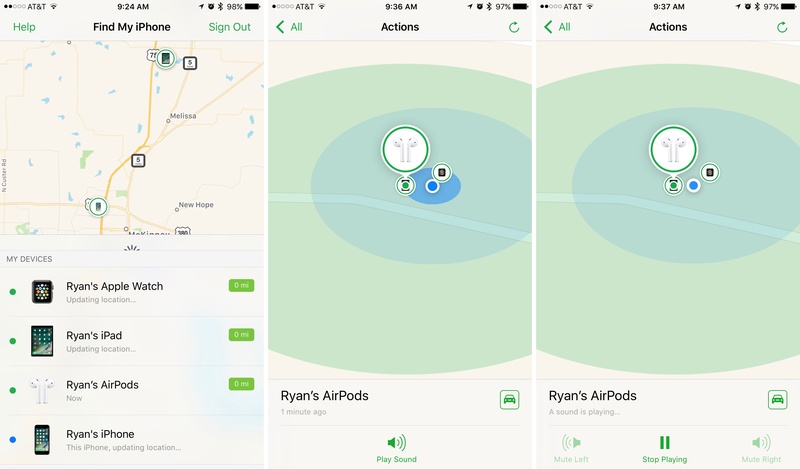 Tracking AirPods via the Find My iPhone app seemed like a no-brainer solution, but that option was not available at AirPods' launch. Fortunately, the option to track Apple's wireless earbuds is available with iOS 10.3. If you own AirPods, there's nothing you need to do to activate Find My AirPods. Simply visit the Find My iPhone app and you'll see that AirPods are now listed among your other devices. Selecting AirPods then the 'Actions' button will present two options. 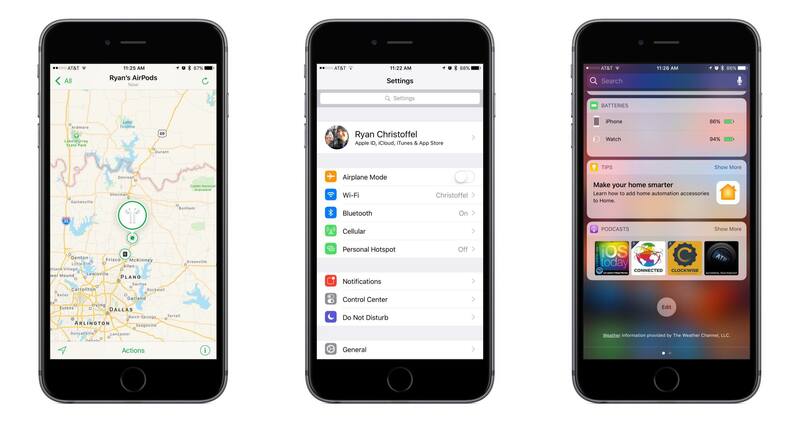 By tapping the car icon you'll receive navigation options in Maps to take you to the AirPods' location. Tapping the 'Play Sound' button will cause a light dinging sound to emit from the AirPods; gradually this sound grows louder until it reaches max volume. Though the sound cannot get as loud as that of devices with more powerful speaker systems, like the iPhone, it does get loud enough that if you're in the same general area as the missing AirPods, you should be able to find them. You may be familiar with the experience of receiving a pop-up dialogue in an app that asks you to rate the app if you enjoy it. These pop-ups can range both in frequency and in ease of dismissal. The worst are those that employ multi-step dialogues, such as first asking, "Do you love our app?" A 'Yes' response prompts you to visit the App Store to rate it, while a 'No' response brings up a feedback survey or email template to complete. 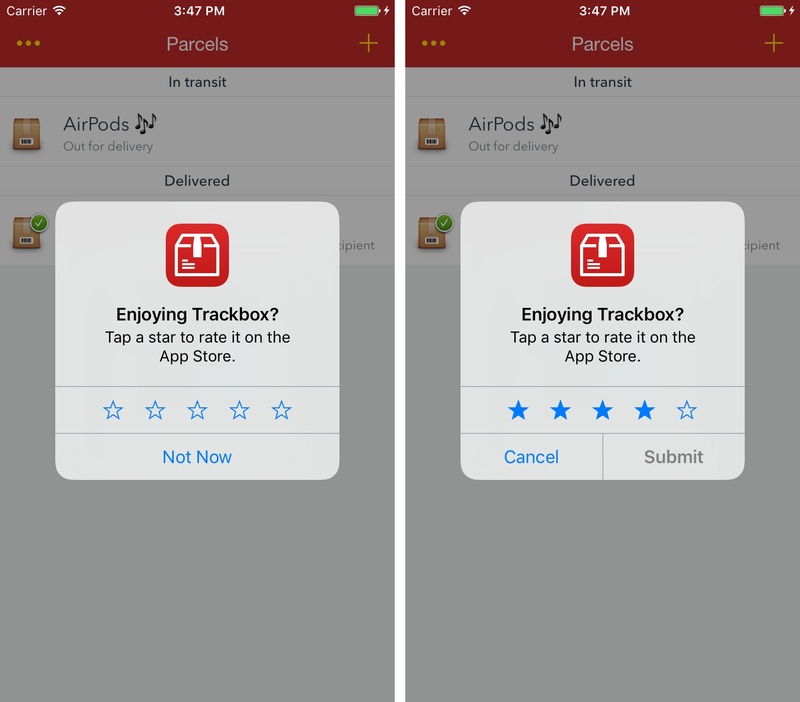 To solve this problem, Apple has given app developers the opportunity to use a standardized, more user-friendly in-app review prompt, seen below in Trackbox Parcel Tracking. Should developers choose to adopt Apple's API for review prompts, one of the major benefits is that it will allow users to give star ratings without needing to leave the app they're in. Historically, one of the greatest barriers for me to giving ratings more frequently is that not only did it require leaving the app to visit the App Store, but it also often required entering your Apple ID's password. Both of these roadblocks are removed with the standardized review prompt. One potential drawback for developers that may hinder adoption of the new standard is that it comes with certain restrictions. First, users have the option in Settings to entirely disable in-app review prompts if they choose to do so. Second, prompts can only be deployed by developers a limited number of times per year with each user, and that limited number is managed entirely by Apple; developers have no way of knowing whether they've hit their limit or not. These two restrictions do not apply to review prompts that developers create themselves, only to the new standardized option. But Apple has given notice that at some point in the future they plan to make the new standardized option the only method of in-app review prompting that is allowed. New File System. iOS devices on 10.3 will be running the new Apple file system, APFS. Though this is a major change, at this time it is simply an under-the-hood improvement with no user-facing presentation. Perhaps later this year, as Apple's other platforms move to APFS, we will begin seeing the benefits of the new file system. Settings Improvements. At the top of the Settings app in iOS 10.3 there is a new Apple ID profile menu. 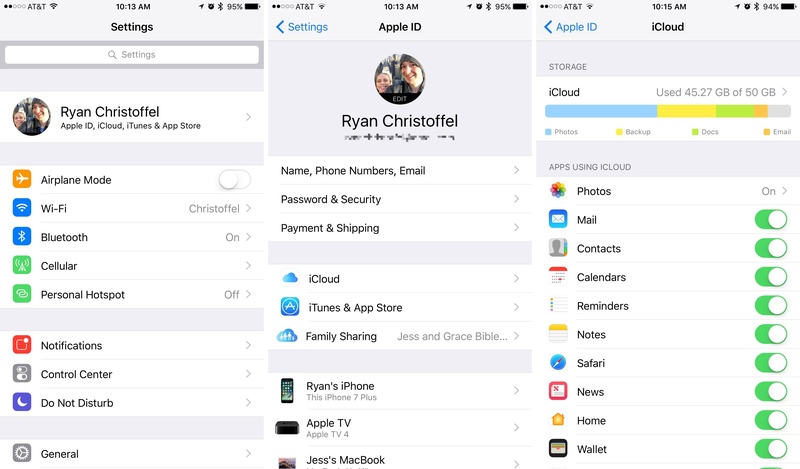 This new screen centralizes many important details about your Apple ID, including basic personal information and a listing of devices associated with your account. Another improvement in Settings is that iCloud storage is now visualized with a graph that shows how much data you've used, and what categories that data is divided into. The graph currently shows me Photos, Backup, Docs, and Email as categories. Developer Replies on App Store. Besides the change to in-app review prompts, there is one other change related to the App Store. Developers are now able to reply to users' reviews on the App Store, whereas in the past that has never been possible. Widget for Podcasts app. Similar to the widgets that you'll find with podcast apps like Castro and Pocket Casts, Apple's native Podcasts app now contains a widget that allows quick playback of episodes without needing to open the app. App Icon Updates. Developers can now update an app's icon without needing to push an App Store update. iCloud Analytics. With iOS 10.3, Apple is beginning to perform analytics of usage and data from users' iCloud accounts. 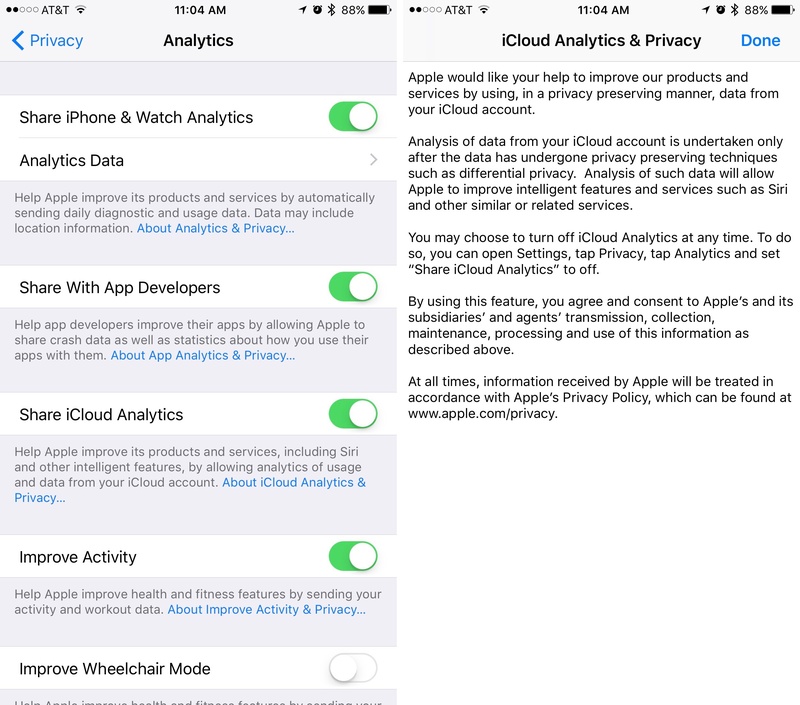 This is meant to improve Apple cloud services in the future, and is opt-in for all users. Education Improvements. For those using the iPad in education, there is an updated version of the Classroom app that contains a number of improvements. You can create unmanaged classes without the need for MDM configuration, documents can be shared between teachers and students via AirDrop, student iPads can be muted by teachers, and more. Today's update likely marks the last major version of iOS until this June at WWDC, where iOS 11 is expected to be announced.